This scarce hand colored map is a lithographic engraving of Baltimore, Maryland, dating to 1860 by the legendary American Mapmaker S.A. Mitchell, the younger. 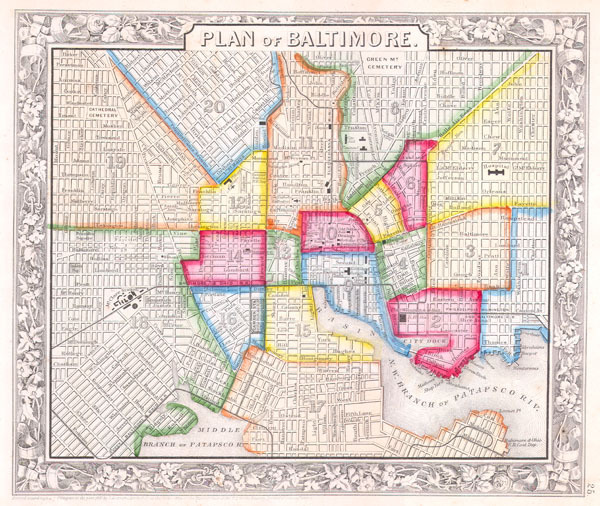 This is perhaps the most attractive of all the Mitchell Baltimore maps, as only this and the 1861 edition offer beautiful vivid hand coloring within each of the city districts. Later editions tend to use only reds. This map was originally part of the 1860 edition of Mitchell's New General Atlas. Dated and copyrighted 1860.